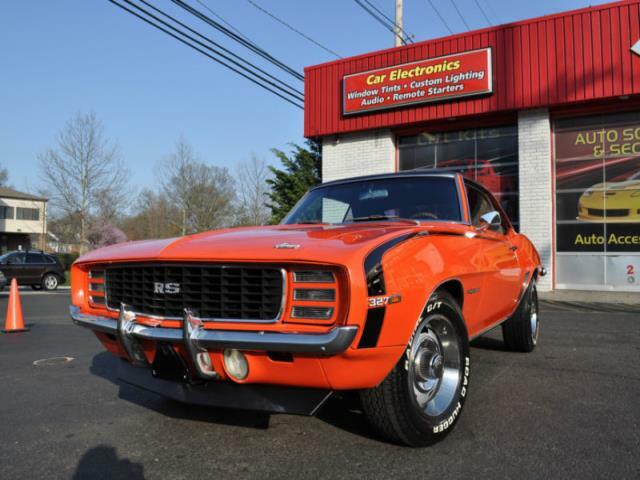 1969 Chevy Camaro RS 4-Speed Matching NumbersHugger Orange Rare Highly Optioned 327 High Performance Motor Check Out The Video Below! If you have been searching for a 1969 Camaro RS in this beautiful frame off restored condition, then please pay careful attention to the details of this eBay No Reserve Once in a Lifetime Event. History. The Chevrolet Camaro is an automobile manufactured by General Motors under the Chevrolet brand, classified as a pony car, and some versions also as a muscle car. It went on sale on September 29, 1966, for the 1967 model year and was designed as a competing model to the Ford Mustang. The car shared its platform and major components with the Pontiac Firebird, also introduced for 1967. First-generation Camaro debuted on a new rear-wheel drive GM F-body platform and would be available as a 2-door, 2+2 seating, coupé or convertible with a choice of 250ci inline-6 and 302ci, 307ci, 327ci, 350ci, or 396ci V8 powerplants. The Camaro was touted as having the same conventional rear-drive, front-engine configuration as Mustang and Chevy Nova. In addition, the Camaro was designed to fit a variety of power plants in the engine bay. 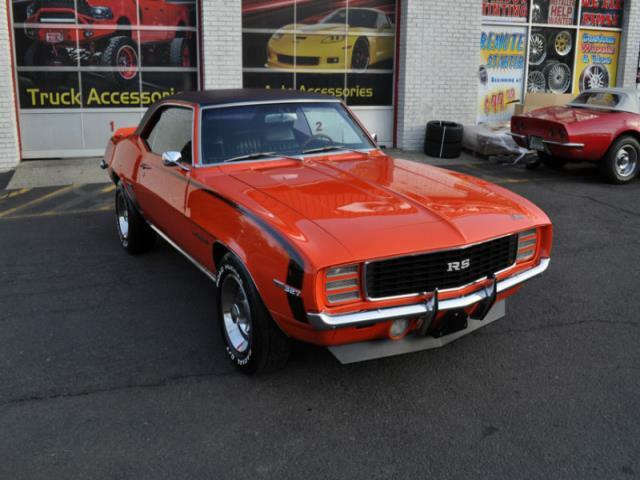 The first-generation Camaro would last until the 1969 model year.This 69 RS is one extremely rare highly desirable investment quality classic. Details. This 1969 Hugger Orange Camaro RS is a real Matching Numbers RS that was fully restored. This car is definitely High Driver Quality and drives just as beautiful as it looks. The Paint shines like new on this Laser Straight Body as the car was previously frame-off restored. The car has the original 327 Motor & a 4 Speed Muncie Trans. This is a Highly Optioned Car with many rare options including the Factory Center Console, Very Rare Factory Rear Window Defroster, Deluxe Interior, & Factory Hugger Orange 72 Paint Code, & Front Disc Brakes. The Deluxe interior is completely restored and is in excellent shape! Upgraded full sound system with Ipod Controls that sounds great. Newer Rally Wheels w/ White Letter Road Hugger Tires in great shape. Under the Hood.Original 327 High Performance Engine along with a 4-Speed Muncie Transmission. Edelbrock Chrome Engine Dress Up Kit as the engine was recently detailed as well. High Performance Headers leading up to a Custom Dual high performance Exhaust System that looks and sounds just as mean as a true american muscle car should sound (watch video below). The car drives great and sounds amazing. The Options.Original Matching Numbers 327 High Performance Motor Beautiful Frame-Off Restoration Factory RS Headlights that do work as they should! 4-Speed Muncie Trans w/ Factory Center Console Rare Factory Deluxe Interior Option Rare Factory Clock Rare Code 72 Hugger Orange Color Option Super Rare Factory Rear Window Defroster Front Disc Brakes Original Jack Equipment Upgraded Sound System w/ Ipod Control Rare Factory Center Console Clean Trunk w/ Mat Brand New Chrome Engine Dress Up Kit Rally Wheels w/ White Letter Road Hugger Tires Custom High Performance Headers Custom Dual High Performance Exhaust that sounds great! Cars Runs and Drives Great Invested over $50, 000! This is the perfect addition to any family! This 69 Camaro RS is as good as it gets, it&apos; s all matching numbers and even the pictures don&apos; t do this car justice. This car is definitely high driver quality & is one beautiful one of a kind first gen camaro. If you have been searching for a 1969 Camaro RS with these rare factory options that drives as good as it looks, this is the car for you. This is the perfect Camaro for anyone who has ever dreamed of owning and enjoying an Iconic rapidly appreciating & arguably the best investment year classic Camaro of all time. If you have any questions or would like to see the car, feel free toe-mail me anytime!